In this tutorial, aerodynamic analysis of a F1 frontwing is presented. 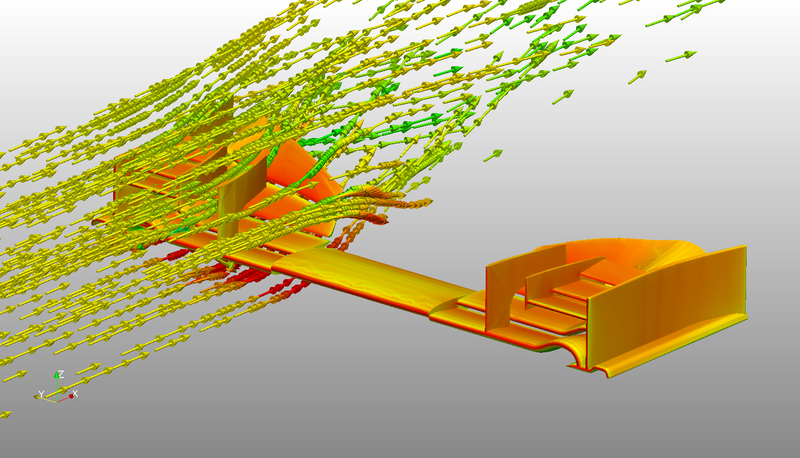 The flow around the wing is modeled as an incompressible, turbulent flow using a k-omega SST turbulence model. This tutorial is based on the first part of the SimScale F1 Simulation workshop series about aerodynamics. We set the mesh operation type to “Hex-dominant parametric (CFD only)”. Similarly add level 6 for Region2 and level 7 for Region3 and save. Now we will group the surfaces of the mesh into “Topological Entity Sets” which will help us to define the boundary conditions in the next step. For the inlet select the ‘Velocity Inlet’ boundary condition, specify the values shown in the figure below, assign ‘Inlet’ entity set for this boundary condition and click on save.